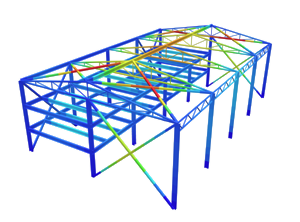 After a structure has finished solving, you can view the member results of the structure in 3D with colour contours. 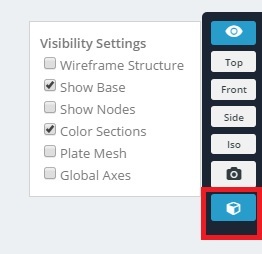 Simply click the 3D button on the right after a structure has solved. To view the 3D rendered results for member results, simply click the ‘Member Results’ menu button on the left. The dropdown allows you to select many different types of results which will be visually represented on a scale of colours. Red indicates the highest of results, whilst blue indicates the lowest of results. Sometimes it helps to review the true and exaggerated deflected shape of your structure, to check the strength and connectivity of your model. To view the 3D rendered results for deflection, simply click the ‘Deflection’ menu button on the left. The slider allows you to turn off the deflection, show true deflection, an exaggerated auto deflection, auto deflection x 2, auto deflection x 3, auto deflection x 5. To view the 3D rendered results for plate results, simply click the ‘Plate Results’ menu button on the left. The dropdown allows you to select many different types of results which will be visually represented on a scale of colours. Red indicates the highest of results, whilst blue indicates the lowest of results.